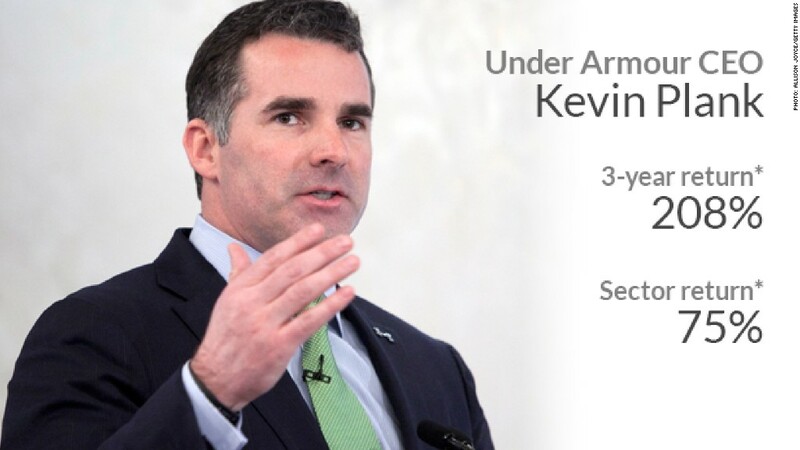 Former University of Maryland football player Kevin Plank founded Under Armour (UA) in 1996 from his grandmother's basement. Today the athletic apparel company is worth more than $14 billion. Under Armour, one of the newest members of the S&P 500, hit a homerun in 2013 when its stock spiked 80% amid continued sales and market share gains. Under Armour returned 208% over the past three years (ending June 30). That far outpaced the S&P 500 performance and all other "consumer discretionary" stocks over that span. But Plank isn't content with Under Armour's dominance in the performance apparel category he helped create. Earlier this year Under Armour reached a 10-year deal worth a reported $100 million to become the official sports apparel outfitter of Notre Dame's varsity teams. Plank also announced plans for Under Armour to go head-to-head with Nike (NKE) and Adidas (ADDDF) in the running market.